This suite is set over two levels with a world class Spa on the mezzanine level which includes jacuzzi bath, sauna and steam room area. £100 Deposit is charged at the time of booking with the balance of the room rate charged to the card provided, 2 days prior to date of arrival. 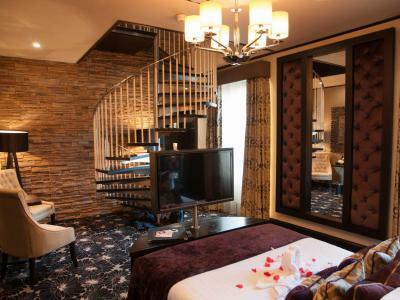 Relax and enjoy and overnight stay in the luxury of our Stuart Suite with private spa This suite is set over two levels with a world class Spa on the mezzanine level which includes jacuzzi bath, sauna and steam room area.